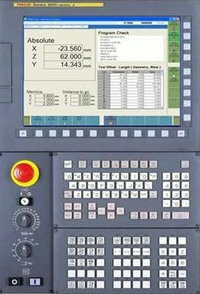 Fanuc G86 Boring Cycle is used to bore the hole(s). The tool travels to the bottom of the hole with feed and then retracts back out of the hole at rapid feedrate. X Y – Hole position data. F – Cutting feed rate. K – Number of repeats (if required). 1 – After positioning along the X– and Y–axes, rapid traverse is performed to point R.
2 – Drilling is performed from point R to point Z. 3 – When the spindle is stopped at the bottom of the hole, the tool is retracted in rapid traverse. 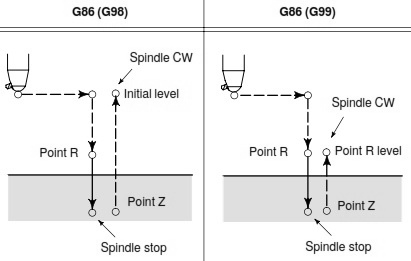 If G98 is specified with G86 boring cycle the tool returns to Initial-level. G90 G99 G86 X300. Y–250. Z–150. R–100. F120.